During the last decade F4E has been promoting fusion as an unlimited and sustainable energy source and in parallel, it has been carefully laying the foundations of an industrial culture in Europe. By being responsible for nearly half of the world’s most ambitious energy project to date, F4E has been entrusted to spread a wide range of skills and stimulate expertise to deliver Europe’s share. In collaboration with the other ITER Parties, and a vast number of partners involved in the project, we have shown our determination to bring the energy of the Sun closer to Earth. ITER has offered us an unprecedented opportunity to convert fusion into political vision by tackling climate change and developing a more balanced energy mix. 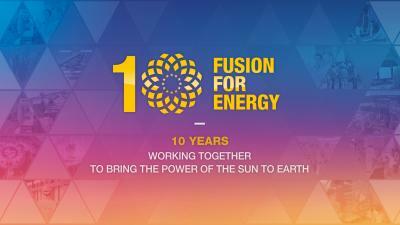 To celebrate what we have achieved by working together, a special F4E event is being organised to remind us all of the remarkable evolution of this one-of-a-kind experiment, and help us reflect on the challenges that lie ahead in making fusion energy a reality. Our list of guests includes distinguished representatives from the European institutions and member states, EUROfusion, ITER, other ITER member states, our European industry and innovation partners, and key personalities who have shaped the progress of fusion energy.